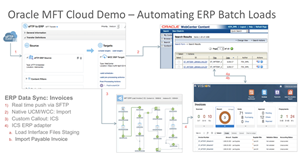 In this blog, we will use Oracle Managed File Transfer (MFT) and Integration Cloud Service (ICS) to automate batch uploads into Oracle ERP Cloud. We will perform this upload with invoices, a typical use-case for organisations that work with numerous vendors and would like their vendors to bulk invoice them through say an SFTP file drop. Folks who have read my previous blog, Using MFT Cloud Service to Automate HCM Batch Uploads – Part 1 will notice how similar this is to HCM Data Loading, except that we use ICS to orchestrate a few post-load steps. That is because HCM and ERP Cloud (also SCM and SalesCloud) are all Oracle Fusion Applications, modules built on the same platform. Some of you may even be on “Global Shared Instances”, essentially running both your HCM and ERP SaaSes in the same instance. Read the complete article here.